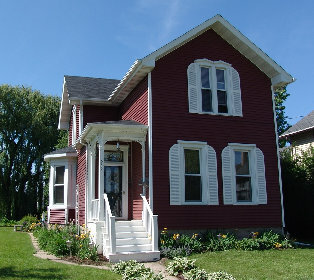 Leslie contacted me about building a transom window for her 1879 two story Victorian home in Oshkosh, Wisconsin. 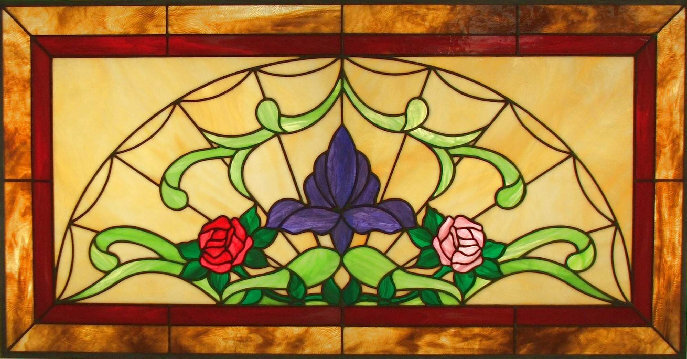 She wanted a garden look with flowers, and wanted the look of a arched top Victorian fan light with "rays" radiating from the center. 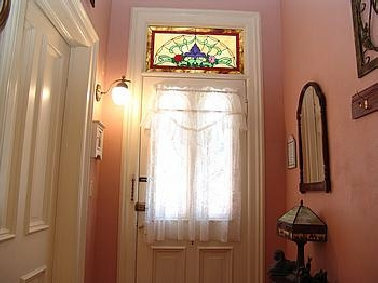 Leslie was wonderful to work with......she knew exactly what she wanted.....but she loved both red and pink roses..... and couldn't decide which to use in her transom. As you can see, she chose one of each. Leslie's Garden measures 17 3/4" x 34", contains almost 200 pieces of glass, and was completed in November, 2005.